Raaga.com: Yash Chopra banner changing trends - From Romance to Violence to Abuses! Yash Chopra banner changing trends - From Romance to Violence to Abuses! The name Yash Raj Film Production was synonymous with love and romantic movies - remember hit romantic movies like DAAG, KABHI KABHIE, SILSILA, CHANDNI, LAMHE, DILWALE DULHANIA LE JAYENGE etc. But in the last few decades the banner shifted its gears to violent films like DHOOM, GUNDAY, MARDANI, LAFANGEY PARINDEY, BADMAASH COMPANY etc. However the latest news is that the banner’s forthcoming movie TITLI has crossed all limits of ethics and virtues as it is packed with filthy expletives (‘Gaalis’) which may even shame the likes of filmmakers Anurag Kashyap and Vishal Bhardwaj, who are known for using expletives in their film. Director by debutant director Kanu Behl and produced jointly by Yash Raj Films Dibakar Banerjee has thus been censored with an Adults Certificate. 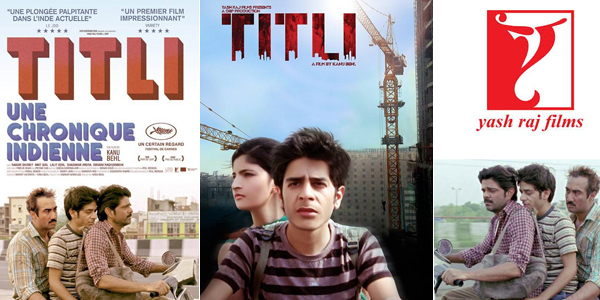 It may be noted TITLI has been winning accolades in film festivals all over the world. It received rave reviews when it was first screened at the 2014 Cannes International Film Festival where it was the official selection in the Un Certain Regard section. It has been screened in almost 22 international film festivals, winning 8 awards and has opened to immense box office success in France and Germany. The film stars Ranvir Shorey, Amit Sial and newcomer Shashank Arora. The movie is slated to release in India on October 16.